Food processors around the world are increasingly demanding tighter ingredient specifications and consistent ingredient performance to meet new product developments as well as facility and equipment upgrades. That is in addition to withstanding the already challenging distribution and storage conditions. Milk powder specifications, specifically spore contamination levels, have been barriers to expanding trade in certain application segments. That was particularly the case in Southeast Asia, where end users cited inconsistencies and lax specifications in some U.S. products. Spores—which can significantly affect product quality and lead to taste, texture and appearance defects—were at the center of those criticisms. There is no silver bullet when it comes to spore control, but implementing an effective cleaning system to remove residual product, fouling and microbes, including spore-formers from processing facilities, will minimize re-contamination from run to run. New Zealand exports about 95% of its dairy production. Australia exports nearly half of the milk that it produces, making it the third largest exporter behind the EU and New Zealand. In the US, exports of milk powders, cheese, butterfat, whey and lactose totaled 161,882 metric tons, equivalent to 14.9 percent of U.S. milk production in June (2016), according to the U.S. Dairy Export Council. With each dairy producing country (US/NZ/AU) increasing its exports, contaminations can significantly impact the bottom line. ClorDiSys Solutions and its partners are positioned around the world to help eliminate these contaminations and ensure product quality and safety. Some facilities have implemented procedures to execute fumigations of their facilities on a yearly, bi-yearly, or other routine basis. This supplements the regular wash-down procedures which are currently employed by facilities. By utilizing chlorine dioxide gas, the chances of a contamination drastically decline as the gas is able to reach all surfaces and eliminate all organisms everywhere. These are just some of the dairy facilities that have been decontaminated by ClorDiSys. This 1,000,000 ft3 (28,000m3) facility consisted of New Powder Warehouse, Old Powder Warehouse, Tote Packaging, Stork Dryer, Delaval Dryer, MCC and Bin room. The Dryer areas both consisted of ceiling heights greater than 90 ft (27m) with various equipment and access platforms. This 300,000 ft3 (8,500 m3) facility consisted of a small packaging room, a mixing room, and a Dryer Room. The Dryer Room was 70ft (21m) in height and consisted of various processing equipment with access platforms. Even after thorough cleaning and liquid decontamination, a persistent salmonella problem could not be eradicated until gaseous chlorine dioxide was used. 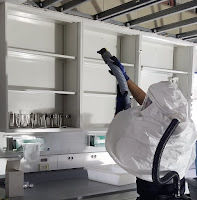 This facility required decontaminations of an aseptic room of approximately 9,000 ft3 (255 m3), 2 processing vessels (Tank #8V, and Tank #9V) and all piping leading to and from the area of approximately 8,500 ft3 (241 m3) and an additional room of approximately 10,000 ft3 (283 m3). This 1,300,000 ft3 (36,812 m3) facility consisted of Several Production Areas (4), Sandwich Mezzanine, Re Run Room, Old Kitchen, Kitchen 1st and 2nd floor, Old 40 Degree Room, New 40 Degree Room, 40 Degree Room, several Tank Alley’s, and CIP room. This 578,000 ft3 (16,367 m3) facility consisted of Niro Room, Bin Room, Recon Room, Packaging Room and Control room. To read more about the decontamination of dairy facilities, click here. We are also hosting a Food Facility Decontamination Service webinar on Thursday, March 7th with other industry applications.